Business Intelligence products for smarter insights. Start using innovative, end-to-end Business Intelligence solutions infused with AI. Work smarter by combining augmented intelligence, data analytics governance, visual analytics and data-driven insights. Explore data patterns and get consistent, trustworthy insights. Achieve the best data-driven outcomes. 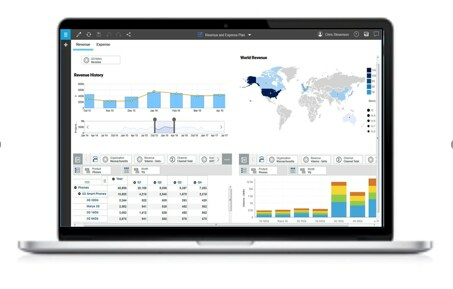 ALL-NEW IBM Cognos Analytics takes the drudgery out of data exploration. Use augmented intelligence to find, explore, and share data-driven insights in a governed environment. Easily create and distribute compelling reports and eye-catching dashboards. Built-in AI assistant and automatic pattern detection guides users to actionable information, enabling confident decision-making. Available on-prem or on cloud. Powered by IBM TM1. Planning Analytics automates your financial planning, budgeting, forecasting and analysis processes. It offers the full functionality of spreadsheets while eliminating manual tasks to drive efficiency. IFRS 16 compliance - are you ready? Read our blog to find out how to meet the IFRS 16 new leasing standard requirements by using Planning Analytics in combination with IBM's IFRS 16 Solution Accelerator. Get experience with IBM® Planning Analytics IFRS 16 Solution Accelerator to see how it can help you speed up and simplify your lease reporting and meet the requirements of the IFRS 16 leasing standard. This smart paper argues that to deliver useful insights where they are needed in an organization, a modern BI solution must balance self-service, agility, reliability and security. Join IBM experts for this webinar and learn how to unlock the value of BI data and begin the journey to AI. A short report from Aberdeen Group that reveals how a holistic approach to business intelligence, using the right technology, can bring greater user empowerment and more efficient decision-making. A new TVO (Total Value of Ownership) report from Cabot Partners details the cost savings you can achieve with IBM Cognos Analytics both on-premises and on cloud.